What are Zone-Based Firewalls and how to use them? Zone-Based Firewalls (ZBF) is a firewall methodology of placing interfaces into zone and defining traffic definitions to allow traffic to pass or drop. In the past firewalls were comprised of access-list that would define both source and destination as well as having the option to specify a port. This type of firewall is often referred to as a Context-Based Access Control (CBAC) firewall. Traffic defined in a CBAC firewall was either permitted or denied based on the access-list rule sets. Such rule sets are very limited and cumbersome to manage with even a moderate number of access-list definitions. Hence, the creation of Zone-Based Firewalls. In the network below there is a single router, one end-user computer, and two servers. We will be performing a total of three configurations: allow the LAN to reach the Internet using only ping (icmp), allow the DMZ to reach the Internet using only telnet (tcp port 23), and allow the Internet to reach the Server2 and Server3 using only telnet (tcp port 23 and 2323). In a real world use case the configurations are very similar. In that scenario you would likely allow traffic to web or email server in the DMZ rather than allowing telnet. However, the rule sets are exactly the same so you can easily supplement the protocols and ports used for others or add as you see fit. Step 1: Configure all applicable router interfaces. We are also going to assign a secondary IP address on FastEthernet0/0 which will be used later in one of the inbound rule configurations. Step 2: Configure NAT with an access-list so that LAN and DMZ subnets can access the Internet, NAT 1.1.1.2 to 10.1.0.2, and PAT 1.1.1.1:2323 to 10.1.0.3:23. Step 3: Create the required zones and place the applicable interfaces into them. 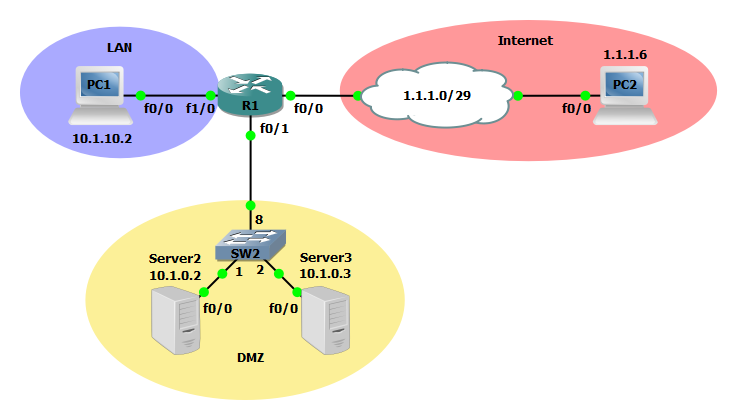 Step 4: Configure a class-map, policy-map, and zone-pair to allow the LAN to reach the INTERNET zone using only icmp. Step 5: Configure a class-map, policy-map, and zone-pair to allow the DMZ to reach the INTERNET zone using only telnet. NOTE: In a real world deployment of Zone Based firewall you will want to configure addition match protocol statements. A few protocols I recommend defining are dns, ftp, https, http, icmp, tcp and udp. To add one or more simply use the command match protocol followed by a protocol when in class-map configuration mode. Step 6: Configure an access-list that allows traffic from any host to the servers on the DMZ using port 23 (telnet). Step 7: Configure a class-map, policy-map, and zone-pair to allow the INTERNET zone to reach the DMZ zone. The key difference for this zone configuration is we are matching the access-group named FIREWALL-EXCEPTIONS-ACL in place of a protocol. Step 8: By default traffic is allowed to the router self zone. The self zone represents the router itself so if you ping an interface of the router it will reply. This is fine from a LAN interface but less than desirable from an interface that is connected to the Internet. Below we will configure the default action to drop traffic from the Internet to the self zone. Step 9: In step 8 we configured a policy-map and zone-pair to block traffic to the self zone from the Internet. 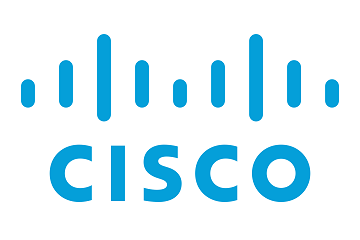 If receive a DHCP address from a Internet service provide your router will no longer be able to obtain a dynamic IP address. You will need to reconfigure the rule sets for the self zones we configured in step 8 to instead match the below. Now that the configuration is finished lets verify remote connectivity using the ping and telnet commands. Use ping to verify you can ping from PC1 to PC2 but not from Server2 and Server3. Similarly ping to the router's outside interface 1.1.1.1 will also not respond. 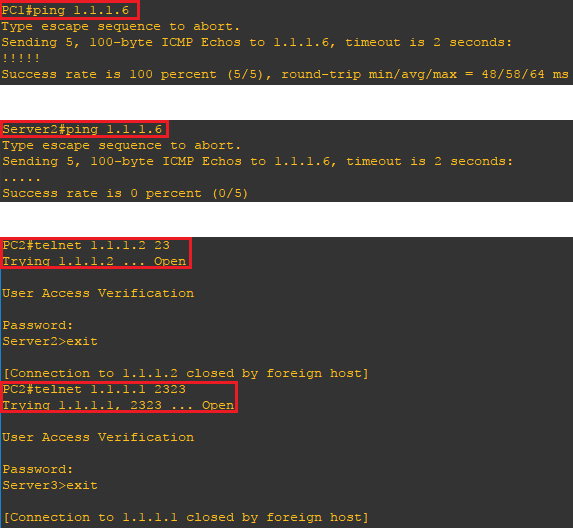 Use the telnet command to verify connectivity to Server2 and Server3 from PC2. The Server3 device will only respond using port 2323 and Server2 will only respond using port 23.